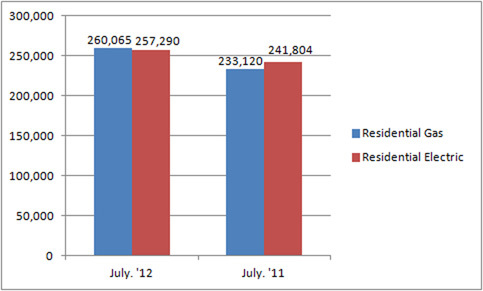 U.S. shipments of residential gas storage water heaters for July 2012 increased 11.6 percent, to 260,065 units, up from 233,120 units shipped in July 2011. 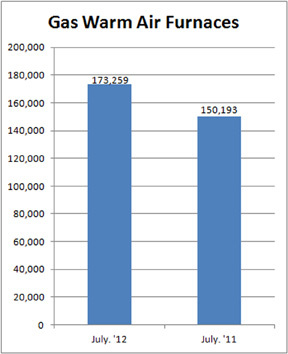 Residential electric storage water heater shipments increased 6.4 percent in July 2012, to 257,290 units, up from 241,804 units shipped in July 2011. For the year-to-date, U.S. shipments of residential gas storage water heaters decreased .6 percent, to 2,304,879, compared to 2,318,027 units shipped during the same period in 2011. Residential electric storage water heater shipments increased 1.1 percent year-to-date, to 2,201,900 units, compared to 2,177,481 units shipped during the same period in 2011. Commercial gas storage water heater shipments decreased 1 percent in July 2012, to 4,892 units, down from 4,943 units shipped in July 2011. Commercial electric storage water heater shipments increased 26.4 percent in July 2012, to 5,256 units, up from 4,158 units shipped in July 2011. Year-to-date U.S. shipments of commercial gas storage water heaters decreased 3.4 percent, to 47,353 units, compared with 49,045 units shipped during the same period in 2011. Year-to-date commercial electric storage water heater shipments increased 7.9 percent to 38,143 units, up from 35,344 units shipped during the same period in 2011. 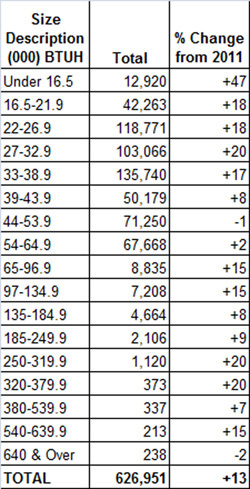 U.S. shipments of gas warm air furnaces for July 2012 increased 15.4 percent, to 173,259 units, up from 150,193 units shipped in July 2011. 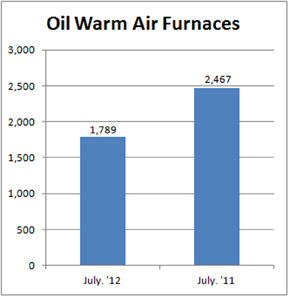 Oil warm air furnace shipments decreased 27.5 percent, to 1,789 units in July 2012, down from 2,467 units shipped in July 2011. Year-to-date U.S. shipments of gas warm air furnaces decreased 1.1 percent, to 1,118,872 units, compared with 1,131,839 units shipped during the same period in 2011. Year-to-date U.S. shipments of oil warm air furnaces decreased 34.7 percent to 14,304, compared with 21,917 units shipped during the same period in 2011. U.S. shipments of central air conditioners and air-source heat pumps totaled 626,951 units in July 2012, up 13 percent from 554,657 units shipped in July 2011. 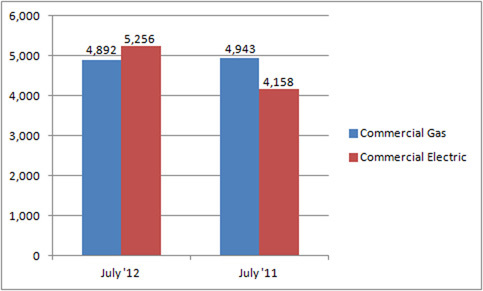 U.S. shipments of air conditioners increased 14.5 percent, to 466,312 units, up from 407,089 units shipped in July 2011. 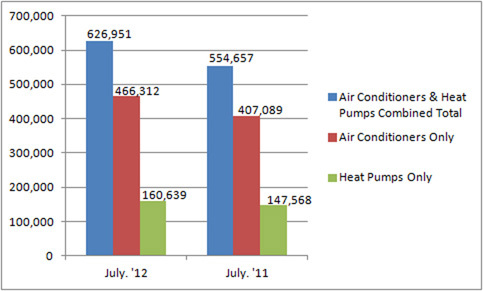 U.S. shipments of air-source heat pumps increased 8.9 percent, to 160,639 units, up from 147,568 units shipped in July 2011. Year-to-date combined shipments of central air conditioners and air-source heat pumps increased .1 percent, to 3,852,992 units, up from 3,847,553 units shipped in July 2011. Year-to-date shipments of central air conditioners increased 3.5 percent, to 2,723,570 units, up from 2,631,856 units shipped during the same period in 2011. The year-to-date total for heat pump shipments decreased 7.1 percent, to 1,129,422 units, down from 1,215,697 units shipped during the same period in 2011.